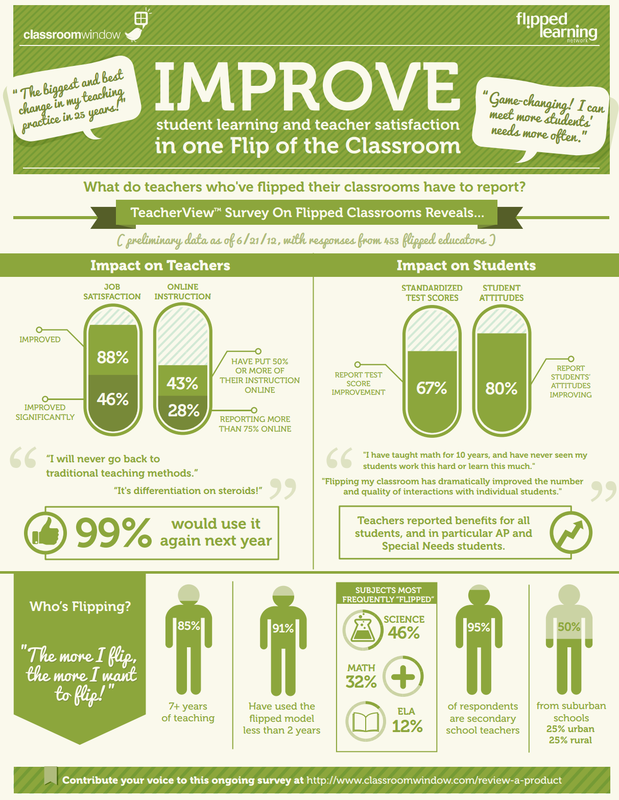 Flipped Learning, or Flipped Classroom, is a teaching method introduced by Jonathan Bergmann and Aaron Sams. To sum it up, it is when you switch the learning content in class and homework, using videos. Jonathan and Aaron argues, that we should “flip” because the education that traditionally are being held in class is teacher monologues and lecture-based talks, and very little room for interaction between the students. This doesn’t harmonize with todays focus on social learning, such as Bruners Scaffolding, Vygotsky’s Zone of proximal development and so on. Meanwhile, the students are given inqury-based home assignments. But at home, only the student recalls what the teacher told him in school. And if the student forgets, there is no help and he will most likely react with frustration. 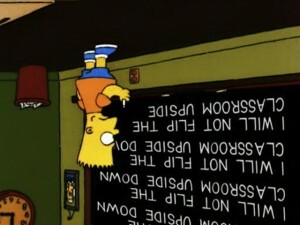 Flipped Classroom “flips” content and location. Lectures are now homework and inqury-based tasks are now classroom activities solved in cooperation with classmates and facilitated by the teacher. I use the prejudice “Traditional education” to describe what I think is an old school teaching method, some call it IRF (Initiate, Response and Feedback). More about that here. But one big difference in the teachers role between IRF and Flipped Classroom, is the transition from instructor to facilitator. A complicated process to go though. The teacher must engage the students by demanding them to ask questions to the video, and take time responding. This is a strong signal to the students, telling them that they are not alone, they can always get help. There are multiple ways to ensure an interaction over video. In YouTube, the commentary section is well suited for that. You can even make a comment that is “grounded” in the timeline. This kind of open comments have the advantage, that students can help each other. The disadvantage is, that students might hesitate asking the “stupid” questions (which almost all the time are the most important). Anonymous comments should therefore be considered. Other interactions could be through discussion forums, synchronous feedback via tools like TodaysMeet.com or Edmodo.com, or audio-resposes via tools like audioboo.fm or present.me. As teacher, you must regularly evaluate whether to produce your own videos or use others. There are pros and cons with both. If you choose a preproduced video, it will not be as customized and well suited your specific class, as a homemade video would. On contrary, the quality is often much better in preproduced videos. I think it’s a good idea to use both. When starting up a new theme or subject in class, use a preproduced. But when following up ongoing discussions in class, produce your own. The production-burden will diminish while you get used to the technical issues, and starts to reuse earlier homemade videos. Of course, one very famous place to find good Flipped videos would be Khan Academy. Also Brightstorm contains a lot of short (2-5 minutes) videos. And then of course iTunes U with a lot (!) of video material from educators. If you are looking for more academic videos, TED Talk would be a great place to look. http://phet.colorado.edu/ is a place for interactive science simulation videos with adjustable parameters. http://ocw.mit.edu/courses/audio-video-courses/ is the MIT educational video database which contains so much more material than just the videos. Finally Open Educational Resources is a great place to find videos. Teachers talk. They love to talk. Therefore it is challenging for a teacher to compress it. None the less, it’s a good lesson learned! Jon Bergmann recommends that the length of the videos stays under ten minutes. After this, students lose a significant amount of concentration. I can confirm that. This graph shows the Audience Retention in one of my Flipped videos. After 6:41, about 30% are still watching. Of course you can demand that students watch the whole video, but this indicates that they will definitely loose interest after about five minutes. The way you disseminate the video should depend on the subject type. Is the learning goal to demonstrate physics experiment? Is it to make the students reflect, analyse, discuss or just a mathematic “go through”? The most used method is a camera in front of a Chalk-, White or SMARTBoard. Like Donald Sadoway. He did this TED Talk using a Chalkboard! One useful method is Screencasts. Screencasts are recordings of the computer screen, typically with a voiceover. Here is a great example of how it can be done. Instead of voiceover, the producer Michael Wesch uses text in an innovative way. Another method is using Green screen. But of course you don’t have a green screen at home, there is a workaround! All it takes is a Kinect camera (the one that comes with the Xbox the game console) and the software Vix (30 days free trail here). I’ve been using this quite a few times, implementing it in Notebook- and Prezi-presentations -> watch it here (Skip to to frame 11 and full screen the video) . These works if you want to give the impression of “being there”. Not talking all the time and filling the holes with inquri-based activities can be challenging. How do you go from a lecture-based monologue to problem-based polyfony? Only hands-on experience will help. The same goes for producing and selecting videos. If you know what works, how to “act” and where to look for materials, you could bring down the preparation time. If you open up your videos for others to use, you will know that you are making a contribution to the 2.0-society, which always comes back threefold!